After three years of schoolboy bliss in the land of Palmyrah, Panniaram and Nongu, a rather unwilling schoolboy was perforce brought by his parents to what used to be then called the land of milk and honey, or rather curd and treacle, Batticaloa. It happened because Commissioner of Prisons C. C. Schokman had finally relented and transferred his erstwhile classmate to a more congenial station. So it was goodbye to friends there, like Renton Hannibalsz, Aries Kovoor and Stanley Mather, who, incidentally now lives in Pittsburg, America. Stanley had, some time ago, read some of this writers nostalgic pieces and had written to him, inviting him to use his home as a base should he ever have the opportunity of visiting the land of the free, home of the brave. The train journey to Batti, as we used to refer to her with affection, was uneventful and long forgotten. But not the arrival at the land that would be home to me for the next six years. Dawn was breaking, as the poets say, when, peering out of the window of the compartment this writer had his first glimpse of his future homeland. The train was chugging to a halt at Eravur railway station, and in about half an hour we would be in Battticaloa. There, the teenager received his first shock. There were no hiring cars, as in Jaffna. But there were buggy carts, drawn by a bull. With what glee he helped put the baggage into one buggy while we all got into another and "Jack, Peter, Mackd " our way through Koddamunai to the resthouse just near the Fort in Puliyantivu, which was to be our home for the next three days  till the Prison Lodge, opposite the Jail, in Hospital Road, was made ready for us to move in. As we jogged along in the buggy, I remember passing signs on either side of the road which read "Bushalting place" (sic) and quite innocently asked Dad what that meant. Dads chuckle of mirth was prophetic, for at that age, this writer never thought he would be ending his career correcting the mistakes of other writers on a newspaper. He was told, in between chuckles, and even guffaws, that there should have been a space between the words bus and halting. At the resthouse there were two spacious rooms prepared for us, and we had hardly finished breakfast when Dad had callers. They were prospective landlords, come to offer their houses to the new public servant, little knowing that a Jailor was provided with quarters by his department. There was one man, the owner of the biggest house in Koddamunai, and all he wanted as rent was Rs. 12.50 a month, with no advance. "And you can pay the first months rent at the end of the month, Sir!" A few months later Eric Drieberg, Excise Inspector, who had a lovely daughter Sheila, a girl of about ten, who was an adept at tap-dancing (which is how I remember the Driebergs) came to Batticaloa on transfer and took the house, as he did not have the privilege Dad had. A few days later, after the furniture, sent by goods train from Jaffna, had been installed at Prison Lodge, we moved from the resthouse to our future home for six wonderful years. It was a cute little lodge, standing on about 80 perches of land, with verandahs the whole length of the front and rear, with four rooms in between them, and a rear verandah extended at a right angle which led to the kitchen and store room. The lavatory was at one end of the garden at the back, with another room for bathing at the opposite end. There were two huge trees, a Neem or Margosa, which came down not long after, at the hands of Stanley Joseph, a carpenter of Covington Road. Years later, as a man, I used to spend my annual vacations there, living with Advocate A. Thavaraja, now alas no more. We had been friends from schooldays and a more staunch one I have yet to find. As a lawyer, he could have held his own with any senior Colombo Counsel who came there. As a matter of fact, Queeens Counsel Eric B. Wickramanayake, once told certain litigants who wanted to retain him in a civil case in the District Court of Batticaloa, "Why do you want me? You have as good a man right in your hometown!" When asked the mans name, he told them, "Why Thavaraja, who else?" The Margosa tree in the hands of Joseph the carpenter (we used to tease him about his name and occupation, calling him the father of Jesus  he was then a bachelor!) became a huge extendable dining table, and two double beds, the last named being still with my children, now nearly seventy years old and as good as new. Next door to Prison Lodge, at the junction of Hospital Road with Covington Road was the prison contractor. His place was a veritable farmyard, for under the new jailor, the prisoners were served better fare than they probably would have had in their own homes. Eggs were only one and a half cents each, when the price of an egg in Colombo was six cents. A fair sized pullet or Naamba was just twenty five cents. In the market across the Kodamunai Bridge, next to the police station, beef was sold at 12 to 14 cents a pound. A large lagoon crab, as big as a cheese-plate or Thasima, cost only three cents and you could buy them live, with their claws made immovable by a twig inserted at the joint. There was a man, I remember, to whom Dad would give two SG cartridges (you could buy them over the counter for twelve cents each at that time) and, in return, the chap would bring a haunch of wild boar. The rest he would sell at 12 cents a pound in the market. Mum had her own vegetable garden at Prison Lodge, for she had green fingers and was also an expert cook. She once confessed to her son that when she married Dad she could only boil vegetables and rice but hadnt the faintest idea how to make curry. Dad taught her, for he had been a scout and scoutmaster, as the letters he had received from Lord Baden-Powell, pasted in a large book marked "Reports" testified. It was a rare case of the pupil mastering the master! Once settled down, it was time for brother Ian and this writer to be sent to school. Dad preferred Methodist Central ollege to St. Michaels College, having decidedly non-catholic tastes, for he had once been a Baptist missionary at the time of the birth of his second son Cecil. At Central College, the first thing that struck the new boy was the Scout Troop, for Mr. S. Thangarasa (he later changed his name to Thambirasa) was not only the Scoutmaster but also my class teacher. I suggested to Dad that I had such an inclination. "Very well," said the man who had corresponded with the Chief Scout himself. "I am sure it will make a man of you." It did, Im sure, for I owe a great deal to Scout training for the versatility I possess. Thangarasa was overjoyed when I conveyed Dads remark to him, with my oral application to be a Scout. He used it at every appropriate opportunity too, to bring in others to the troop and wherever the word Scouting cropped up. Helped by his two brothers and a mango tree that provided us with fruit in season, to say nothing of being a venue for boyish Tarzan games, Batticaloa was indeed paradise for a pre-teenager. It was in this Prison Lodge that the youngest, Ivy Marina was born. I wonder if that house still stands or has been a victim of terrorist activity. In that same year that we went to Batticaloa, 1936, the Batticaloa district suffered one of the biggest floods experienced. The sand bar, three miles away from the town had blocked up the usual flow of excess water from the lagoon into the sea, and the spell of heavy rain filled up not only the lagoon, but quite a lot of the land as well. The Batticaloa esplanade which extended in three parts with roads dividing the open spaces from Central College at one end, the Anglican church, the courthouses and the Resthouse on the left as you looked from the school, and the Residency, the Batticaloa Gymkhana Club and the quarters of the public and civil servants on the right, with the lagoon itself at the opposite end, was completely submerged by flood water which had risen to three or four feet. There, before us schoolboys, was one vast swimming pool. Naturally schools had to be closed, but we students attended class dutifully  to leave our books, shoes and other impediments, and spend our day swimming and frolicking in the floodwaters. This writers best friend in school, Aelian George Russell Puvinayagem, who has now retired but still lives in that town, lucky chap, lived in Koddamunai in a little street called Elizas Lane. It was he who inspired this writer to pen his first literary effort, a poem, after a petty quarrel we had over the Lord knows what. Of course, we made up a few days later and remained the best of buddies. The next best friend was Bertram A. J. Casinader, eldest son of Dads friend Charles Brown Casinader. His brother Prince and my brother Ian were classmates, I have remained in touch with Prince, who followed his uncle S. V. O. Somanaders footsteps and became Principal of Central College. Bertram answered the call from "upstairs" and the last time this writer met him was at a spiritual convention in Kandy. It was at Central that this writer, now counting five decades in journalism, had his backgrounding in the way of his profession. S. V. O. Somanader, then a teacher, later headmaster and finally Principal of Central, was not only one of the finest teachers I have had the good fortune to study under, but was also one of that rare breed  a gentleman to his fingertips. He taught us English and several other subjects, but what endeared him to us was the manner of his teaching. Often he would take us out to Rugam or Unnichchai or Sadurukondan or some such place of historical interest. There, under a huge shade tree, he conducted his class. Those trips did not cost us a cent, for Somanader met every expense out of his own pocket  and the Methodist school teachers were not overburdened with filthy lucre, being Methodists! He was a journalist himself, was SVOS, contributing useful articles on topical subjects to newspapers. It was natural that a boy who admired this man so much should emulate the example of his guru! Came the holidays and the new year. This writers elder brother Teddy had, in the carpentry shed of S. Thomas College, Mt. Lavinia built the skeleton of an 18 foot long canvas canoe. 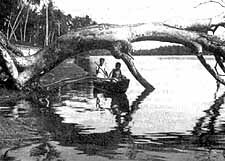 This was assembled and completed at home and young Cecil helped his brother to carry it down to Mudaliyar Namasivayams house close to the lagoon. There the boat was garaged, and many were the pleasant and profitable hours spent on the lagoon, which spread far and wide, from Kalmunai on one side to Valachenai on the other. What fun it was, in those peaceful, pleasant and leisurely days as a schoolboy. Batticaloa is dearer and nearer to the heart of this writer than even Jaffna, for it was there, in an outrigger, on a moonlight night, under the Kalladi bridge that he first found that wonderful thing called Romance. But of that sine die.